This is a truly wonderful baked salmon fillet recipe that is so incredibly quick and easy to prepare. I wish I had the right adjectives to describe the taste – it is simply out of this world, completely and utterly sublime, scrumptious and delicious. Salmon is so incredibly healthy and is simply bursting with goodness in the form of omega 3 essential fatty acids which protect us against cancers as well as being essential for heart and brain health. While looking through quite a few salmon steak recipes, since I had salmon steaks to cook, I got the idea to use teriyaki sauce – which I just love – and so this teriyaki salmon recipe was born. This recipe also makes the best grilled salmon recipe out and you could even grill it on a wooden plank (soaked in water for a few hours) which will impart a wonderful smoky flavour. You could use cedar or any hardwood grilling plank which can be found in some supermarkets or hardware stores. 4T (60ml) mirin - see cooks notes. 1. To make the teriyaki sauce, mix the soy sauce, mirin, ginger and sugar together in a bowl. 2. Place the salmon fillets or steaks in an ovenproof dish and pour the teriyaki sauce over the salmon, making sure it is well coated. 3. Marinade for about 30 minutes, turning the salmon after 15 minutes and recoating with the marinade. 4. Bake the salmon at 180ºC (350ºF) for 10 – 15 minutes or until the fish flakes easily with a fork. 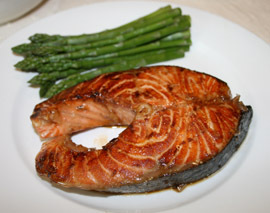 The salmon is baked in the teriyaki sauce. 5. Alternatively, place the salmon and teriyaki sauce in a heavy-based pan and “bake” the fish in the pan with a lid on for about 10 minutes or until the fish flakes easily. 6. If you are going to grill the salmon, preheat the grill to medium-high and cook for 10 – 15 minutes over an indirect heat. Mirin is a sweet rice wine that is used in Japanese cooking. It is available at Asian stores and some good supermarkets. It is very important not to overcook the salmon as it will become dry. Salmon should rather be slightly undercooked rather than overcooked, but I am confident that you will get it just right. I really hope that you and your family love this wonderfully healthy and delicious baked salmon fillet recipe as much as we did. Check out more great salmon recipes!